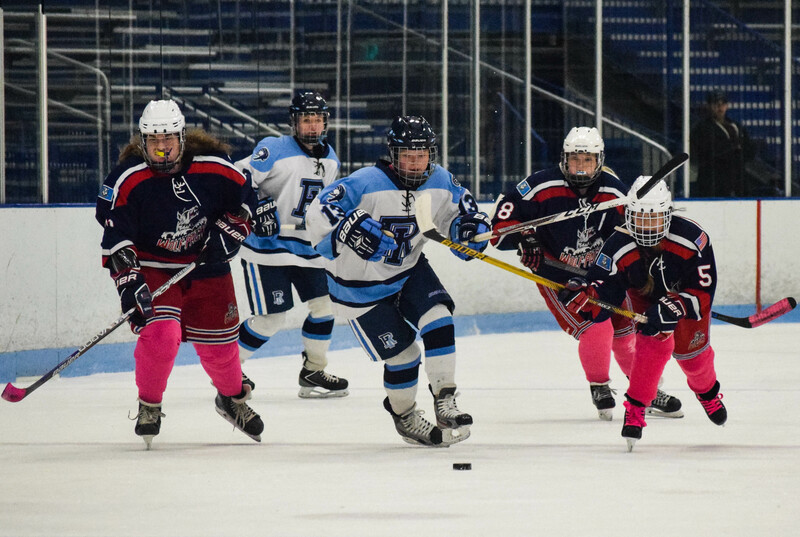 The University of Rhode Island women’s ice hockey team remained undefeated after a 10-0 thrashing over the visiting Hartford Wolfpack at the Boss Ice Arena this past Saturday. The Wolfpack are a 19 and under girls club team out of Connecticut who came to URI on Saturday to visit the campus as well as to play the Rams to get a feel for what college hockey is like. URI wasted no time to get going, as Brynne Costa started things off with a wraparound stuff-in goal, just 3:18 into the first period. After a minor penalty to Monica Darby was killed off, Rams senior Lexie Stefekos buried a rebound, top shelf to make it 2-0. The Rams dominated the majority of the period in terms of possession as well, and with 2:30 left in the first, Casey McCormick scored on a breakaway to make it 3-0. Jillian Holden would join the fun and make it 4-0 just before the first intermission. In the second, the Rams picked up right where they left off. Less than a minute into the period, McCormick notched her second of the game to make it 5-0. About two minutes later Anita Mayfield-Sheehan received a great feed from behind the net to put URI up six. With 12:28 to go in the period, Holden threw a wrister through traffic for goal number seven for URI and he second personal goal of the day. The third period was just icing on the cake for the Rams. Darby scored on one of the Rams’ only power plays to extend the lead to eight. Less than three minutes later Samantha Evans scored on a soft pass that she just slid by the goaltender for goal number nine. With 4:15 left in the game, Madison Bulatowski scored on a nifty forehand, backhand move on a breakaway as she lifted the puck into the roof of the net. The final seconds ticked off of the clock and Rhode Island clinched their fourth victory of the season, 10-0. Rhode Island now travels to the University of Massachusetts in Amherst, Massachusetts next weekend for the ECWHL Showcase.